The US Department of Labor Wage and Hour Division can also assist with Fair Labor Standards Act (FLSA) violations – specifically minimum wage and overtime issues. Not sure how to claim unpaid wages? Read this helpful guide to learn more. The unpaid wages claimed must fall within state parameters – generally no less than a certain dollar value ($50 - $100 is a common minimum range) and no more than a certain dollar value (this generally ranges from $5000 - $10,000, values higher must be pursued in the courts). The unpaid wages claimed must be from employment, not contract work. Almost all household workers are by definition employees, not independent contractors. There is a time limit – generally no more than 2 years, within which the claim must be filed. Employee and Employer name, mailing address and telephone number. The gross amount of claim, including supporting documentation on how the amount was arrived at. Length of employment – include dates. The type of unpaid wages claimed (e.g. non-payment, overtime, improper deduction, etc.). 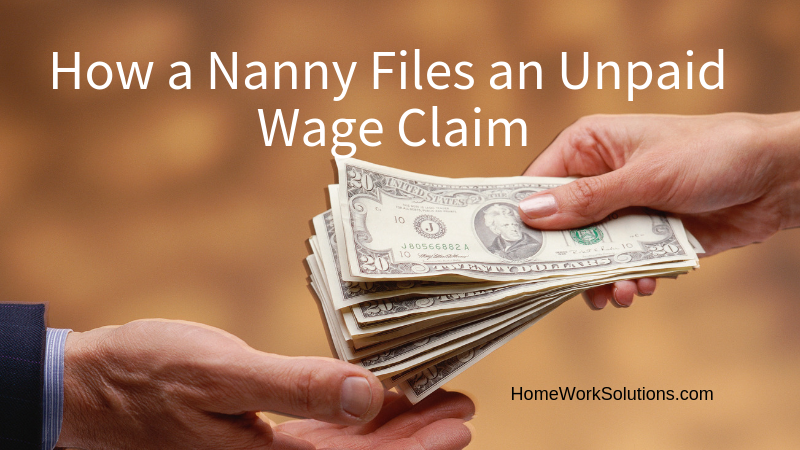 Here's what to expect when you file an unpaid wage claim. Most claims are resolved within 30 – 60 days. If they can’t help you, the wage and hour office will refer you to other resources or attorneys. Most states have laws which provide job protection if you are terminated as a result of filing a wage claim against your current employer. Federal law provides job protection if the claim is related to unpaid overtime or failure to to meet minimum wage. The fastest way to find the specifics in your state (where you worked) is to do an internet search “Filing an Unpaid Wage Claim in [STATE].